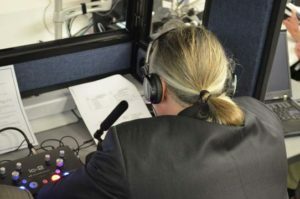 Simultaneous interpretation is the act of orally interpreting audio with only few seconds of lag time. A strenuous task for any language, four languages in particular that are tough to simultaneously interpret are Arabic, German, Korean, and Navajo. In part one of this blog, the two older languages, Arabic and German will be discussed. The alphabet which would eventually evolve into the Arabic alphabet was first developed by the Nabataeans, who established a kingdom in modern-day Jordan around 200 BC. The history of the German language, although not the German language used today, traces all the way back to about 6th century AD. Contrasting to English, in the most authentic Arabic sentence, the verb will appear first. Singular, dual, and plural form exists in Arabic as well, meaning nouns, adjectives, and verbs must be understood in all three of these different forms. Arabic is a phonetic language; each of the 28 letters are defined by a sound. Two of the toughest sounds to pronounce properly for native English speakers stem from the letters ع (ain) and غ (ghain) because neither of these sounds exists within the English language. Finally, the most difficult aspect of the Arabic language derives from its three different forms: Quranic, Modern Standard, and Colloquial. Quranic Arabic is the language used in texts from the times of the Umayyads and Abbasids. Modern Standard Arabic, although very useful and relevant, is usually only spoken in formal situations. People prefer to speak in their colloquial dialects, which are often easier and allow sentences to flow at a better pace. Unfortunately, there are many colloquial dialects that all differ from one another. The Arabic spoken in Morocco will not be the same as the Arabic spoken in Jordan or Egypt. For starters, like Arabic, German offers lots of different regional dialects, as many as 250. However, the toughest part about interpreting German involves its sentence structure. The German language has strict rules involving the placement of verbs within a sentence. In most cases, the verb will come second, however, if certain conjunctions exist within a sentence, like the word weil (because), then the verb may get pushed all the way to the end. Furthermore, the standard sentence form orders in time, manner, then place, while in English it is place, manner, and then time. To explain, the sentence “Matt is going to Pittsburgh with the car tomorrow.” interpreted to German would literally read “Matt is going tomorrow with the car to Pittsburgh.” For an interpreter, managing the different timing of the delivery of such words makes simultaneous interpretation even more demanding. What are some languages other languages that are difficult to simultaneously interpret? Do you agree that the examples used above are challenging? Can you provide any tips on interpreting Arabic or German? I have a small amount of experience with the German bit so I absolutely understand the challenges regarding sentence structure when it comes to simultaneous translation! Keep up the good work! Thank you very much for your comment and I am glad you enjoyed it! Hope you are looking forward to Part II; the other two languages that will be discussed are less traditional and can be quite a handful for interpreters! Very well written piece Zach. The Arabic portion was of particular interest to me and I have done simultaneous translating and your points were spot on. Hope to read more of your pieces. Masalama! I appreciate the compliment and glad that you were interested in this blog. More of my pieces will be posted in the future, including Part II to this blog which will discuss Korean and Navajo. Masalama! Are you fluent in all of the above discussed languages (Arabic, German, Korean and Navajo)? Which one was the toughest to master? What is your favorite language of all? Thank you for your comment. I am actually not fluent in any of the languages discussed in this blog. The information reflected in this blog is based off of research. However, I am currently studying Arabic at McDaniel College, so that is the language that I have the most knowledge on of the four. I have thoroughly enjoyed studying the Arabic language and the culture that surrounds the language. I am also interested in studying Navajo and Korean. Although these languages are tough to master, it is definitely worth the time and effort. Learning a new language is very rewarding!